Objective Our primary objective was to examine the global paediatric workforce and to better understand geographic differences in the number of paediatricians globally. Secondary objectives were to describe paediatric workforce expectations, who provides children with preventative care and when children transition out of paediatric care. Design Survey of identified paediatric leaders in each country. Setting Paediatric association leaders worldwide. Main outcome measures Paediatrician numbers, provision of primary care for children, age of transition to adult care. Results Responses were obtained from 121 countries (73% of countries approached). The number of paediatricians per 100 000 children ranged from a median of 0.5 (IQR 0.3–1.4) in low-income countries to 72 (IQR 4–118) in high-income countries. Africa and South-East Asia reported the lowest paediatrician density (median of 0.8 paediatricians per 100 000 children, IQR 0.4–2.6 and median of 4, IQR 3–9, respectively) and fewest paediatricians entering the workforce. 82% of countries reported transition to adult care by age 18% and 39% by age 15. Most countries (91%) but only 64% of low-income countries reported provision of paediatric preventative care (p<0.001, Cochran-Armitage trend test). Systems of primary care provision varied widely. A majority of countries (63%) anticipated increases in their paediatric workforce in the next decade. Conclusions Paediatrician density mirrors known inequities in health provider distribution. Fewer paediatricians are entering the workforce in areas with already low paediatrician density, which may exacerbate disparities in child health outcomes. In some regions, children transition to adult care during adolescence, with implications for healthcare training and delivery. Paediatrician roles are heterogeneous worldwide, and country-specific strategies should be used to address inequity in child health provision. Significant discrepancy between burden of disease and distribution of health professionals has been documented. Various structures are in place for paediatric care across the globe. The global distribution of paediatricians, their role in providing care to children and the structure for child health systems in various countries are not known. There are inequities in both paediatrician distribution and numbers of new paediatricians entering the workforce in areas with high child mortality. Most countries provide some regular primary care for children, but the systems to provide that care are highly variable. In many areas, children transition from paediatric care in early adolescence, with implications for training and care delivery. The discrepancy between the global burden of disease and the distribution of health professionals has been well-described.1–9 Areas with the highest disease burden have the lowest percentage of health professionals, exacerbating the impact of the health workforce deficit. The WHO has identified an index of 4.45 health workers (physicians, nurses and midwives) per 1000 population necessary to meet the Sustainable Development Goals (SDGs) by 2030.6 Countries are called on to set specific targets for numbers of health workers including physicians and health specialists depending on their needs and health services structure. Child health was a focal point in the Millennium Development Goals and continues to be important in the SDGs. Epidemiological shifts towards non-communicable diseases, a renewed focus on optimising child development, the unique health needs of adolescents and emphasis on reducing morbidity not just mortality, all require renewed deliberation about how healthcare for children is delivered and advanced.10–12 Differing health system designs lead to wide variability in the roles that paediatricians and other child health providers fill in supporting the health of a country’s children. Understanding those roles is vital to providing equitable and quality healthcare and to developing appropriate training competencies for all child health professionals. Some regional efforts have been undertaken to understand where paediatricians are working and what roles they play, but the paediatric workforce worldwide has not been previously described.6 13–15 Similarly, while health systems have been described on country and sometimes regional levels, a global understanding of healthcare systems for children and their variation can provide valuable information for potential reforms at country level. The goal of this study was to examine the global status of the paediatric workforce and to better understand geographic differences in the types of work that paediatricians undertake in the provision of child healthcare. Our objectives were to identify the number of paediatricians globally, examine paediatric workforce expectations, understand who provides children with regular promotive and preventative care and to learn when children transition out of paediatric care to adult care. An online survey was developed using REDCap, an electronic survey tool.16 The survey queried the number of paediatricians per country, expected workforce changes, primary care provision for children and age of transition to adult care (online supplementary file 1). Faculty at Boston Children’s Hospital initially piloted the survey with cognitive interviewing to improve question clarity. The refined survey was further piloted and edited with paediatric leaders within the Global Paediatric Education Consortium representing Europe, Asia, Africa and the Middle East.17 As the internationally agreed on languages for communication between paediatric societies in the International Paediatric Association (IPA) are English, French and Spanish, the final survey was translated into French and Spanish by DR Interpreting, Inc. Translated surveys were sent to native French and Spanish speakers to confirm accuracy of the translation. Patients and the public were not directly involved in the design of this study. The survey was distributed to identified paediatric leaders with a goal of attaining one response per country or economy. Countries and economies for inclusion were defined as the 193 UN member countries plus the 5 World Bank Economies (Hong Kong, Macau, Palestine, Puerto Rico and Taiwan) with populations of over 500 000 people, for a total of 198 countries and economies. The survey was initially distributed in May 2015 via email to the lead delegates from the 121 countries with active membership in the IPA at that time. Regional and subspecialty societies that did not function at the country level were excluded. The survey was sent to non-respondents each week for three consecutive weeks. In a second phase, contact was made with paediatric leaders within the non-responding countries as well as an additional 45 countries in which paediatric leadership was identified through contacts known to the author group, networks from the Global Paediatric Education Consortium, International Paediatric Academic Leaders Association, Harvard University, the American Academy of Paediatrics Section of International Child Health or through contacts with country Ministries of Health. Paediatric leaders from non-responding countries who were in attendance at the International Paediatric Congress in August 2016 were also identified and approached. A majority of countries (73) had a single response. Of those countries with duplicate responses to the survey, 30 had only one complete response and 17 required further review by the authors (BH and CR). Of those, seven countries had identical duplicate responses or the response that was most complete was selected. Ten countries were contacted to clarify duplicate responses and nine clarified. One country had two responses with some variation, and the respondents could not be reached for clarification; for that country, the response from the president of the country’s paediatric association was used. Country statistics for populations under age 18 were obtained from publicly available Unicef country statistics.18 Income and gross domestic product (GDP) classifications were based on 2016 World Bank groupings. Paediatric workforce characteristics were described using frequencies, medians and IQRs where appropriate. Comparisons between regions were calculated using Kruskal-Wallis tests and Fisher’s exact tests, while comparisons between GDP categories were calculated using Cuzick’s non-parametric tests for trend and Cochran-Armitage trend tests. Data were analysed using Stata (Stata 2015. Stata Statistical Software: Release 14. College Station, Texas, USA). The study protocol was reviewed by the Institutional Review Board at Boston Children’s Hospital and deemed not human subjects research. Responses were received from 95 (79%) of the 121 countries with IPA membership and 121 (73%) of the 166 total countries and economies for which a contact was identified (online supplementary file 2). In total, this represented 61% of the global 198 countries and economies. Eight countries responded in French, 10 in Spanish and the remainder in English. There were 32 countries for whom no contact was identified and therefore no survey sent and 45 countries that did not respond to the survey (table 1). No contact identified and non-responder countries did not vary significantly from responder countries by GDP (p=0.18, Fisher’s exact test), but did vary by region (p=0.002, Fisher’s exact test), with more no contact identified countries located in the Western Pacific and more non-responders in Africa. Countries with no contact identified had significantly smaller populations than those targeted, with a median population of 274 000 as compared with a median population of 10 million in responder countries (p<0.001, Kruskal-Wallis test). 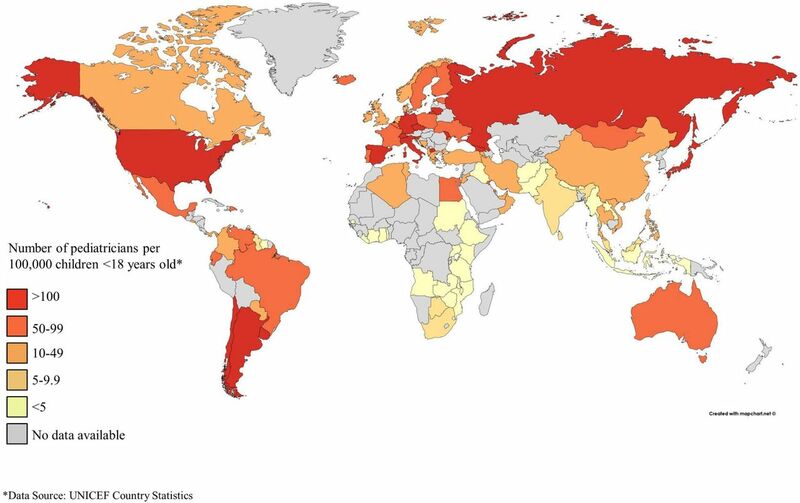 The number of paediatricians reported was normalised against the population of children under 18 years old in each country to obtain a paediatrician density ratio (figure 1). Paediatrician density varied significantly by GDP, ranging from a median of 0.5 paediatricians per 100 000 children in low-income countries to a median of 72 paediatricians per 100 000 children in high-income countries (p<0.001, non-parametric trend test, table 2). In addition, significant variability was seen by region (p<0.001, Kruskal-Wallis test, table 3). The lowest density was seen in Africa (median of 0.8 paediatricians per 100 000 children, IQR 0.4–2.6) and South-East Asia (median of 4 paediatricians per 100 000 children, IQR 3–9) as compared with a global median of 32 paediatricians per 100 000 children (IQR 5–74 and 59 and 87 per 100 000 children (IQR 38 109, and 49–135) in North America and Europe, respectively. Pediatrician density per 100 000 children <18 years old*. The number of new paediatricians entering the workforce also varied by GDP classification (p=0.01, non-parametric trend test) and by region (p<0.001, Kruskal-Wallis test). In low-income countries, the paediatric workforce gained a median of 10 new paediatricians per year or 0.08 per 100 000 children, while in high-income countries, the median was 60 new paediatricians per year or 3 per 100 000 children (table 2). In Africa, countries anticipated a median of 5 new paediatricians (0.08 per 100 000 children) per year as compared with a global median of 30 (1.44 paediatricians per 100 000 children) (table 3). Age of transition out of paediatric care did not vary by GDP (table 2) but did vary by region (p<0.001, Fisher’s exact test, table 3). 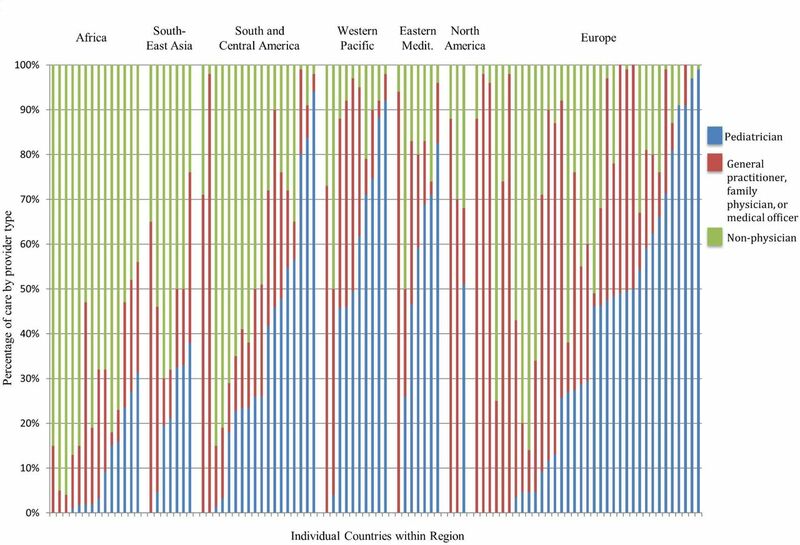 Notably, in South-East Asia, Africa and the Eastern Mediterranean, over 65% of countries reported that children transitioned from paediatric care by age 15 years, whereas less than 45% of countries reported transition by age 15 in South and Central America and less than 15% in Europe, North America and the Western Pacific. Most countries (91%) responded affirmatively when asked ‘do children in your country receive regular preventative and promotive care throughout childhood (well-child checks, growth monitoring, nutrition assessment, parenting advice, anticipatory guidance, immunization) by either a physician or non-physician health care provider?’ This rate was considerably lower in low-income countries, where only 64% of countries reported regular primary care (p<0.001, Cochran-Armitage trend test, table 2). The type of provider seen for primary paediatric care varied (figure 2). Worldwide, children see non-physicians as the primary care provider a median of 28% of the time (table 2, table 3, IQR 9%–59%). If children saw a physician, that person was a paediatrician (rather than general physician, family physician or medical officer), a median of 33% of the time. Type of provider seen for primary care. This study identified that many children transition from paediatric care to adult care by age 15, relatively early in adolescence. Age of transition varied by region but not by country income, suggesting that it may be more associated with cultural or professional norms around transition to adulthood rather than workforce planning. Improved understanding of the systems of care for adolescents is critical among UN, WHO and Lancet Commission calls for increased focus, expertise and research on adolescent-specific care.10–12 With early transition to adult care, advancing the adolescent health agenda may require a defined framework for adolescent services and multisectoral approach that engages youth within their communities. Our study demonstrated that while most countries offered some form of broadly defined preventive care to children, this primary care role is often filled by non-physicians or generalists. In both high-income and low-income countries, task shifting and task sharing have been important and often successful methods for improving access to care and addressing health costs while retaining quality of care.35–39 Most countries continue to explore the appropriate skills mix for providing care, particularly in community settings. Optimising this skills mix will require interprofessional collaboration and training to promote successful multidisciplinary primary care. System planning needs to account for and support the primary role of family and the informal care structures that may exist in communities. A thoughtful country-level approach is required to balance development of preventive and community interventions, alongside secondary and tertiary level services with appropriate referral structures. This study has several limitations. We found no validated tool that would appropriately meet our study objective, therefore developed the survey de novo. Despite piloting the survey among multiple countries, cultures and languages, it is possible that some terms, while commonly used, may have been interpreted differently in different settings, particularly among respondents for whom French, English or Spanish was not their native language. All data were collected as survey responses, usually from a single representative in each country. While we targeted experts at the national paediatric association level who would have knowledge of the state of paediatrics and child health in that nation, responses could vary among individuals particularly for more subjective questions. While we achieved a high level of response globally, there were regional gaps, with particular low responses from West Africa and the Western Pacific. Countries with low physician density and population were similarly under-represented in this sample. These challenges may have been due to language or internet access difficulties, absence of or less active national paediatric organisation or simply limited paediatric presence in those countries. This study was focused on paediatricians, a small component in any country of the human workforce related to child health and health systems. However, paediatricians are important resources for countries, with substantial understanding of child health needs who can also help support country development of child health services and provide guidance for the continuum of care for children and families. As the global community seeks universal health coverage and works to address the known shortage in healthcare workers, care should be taken to meet the health workforce needs of the world’s children and adolescents. Clarification of paediatrician roles and accompanying skill mix is important in developing health workforce capacity to meet those needs. This study described the state of the paediatric workforce worldwide with notable variability in paediatrician density and roles in different countries. A training capacity gap in countries with high disease burdens may exacerbate the problem of a small workforce relative to healthcare needs. These findings highlight the need for country specific child health workforce strategies, assisted by the development of standardised tools to monitor healthcare capacity and outcomes as countries focus on meeting the SDGs for child health. The authors wish to thank Edgar Vesga for his assistance with survey implementation, members of the Global Pediatric Education Consortium who piloted the survey, Julie Hurlbut for assistance with data analysis, tables and figures, Lisa Asaro and David Wypij for assistance with statistical analysis and Judith Palfrey for editing. WHO. Health workforce Requirements for Universal health coverage and the sustainable development goals: Human Resources for Health Oberserver Series, 2016:17. Every Woman Every Child: The Global Strategy for Women’ s, Children’ s and Adolescents’ Health (2016-2030) , 2016. UNICEF. Country Statistics. 2015 https://wwwuniceforg/statistics/index_countrystatshtml. WHO. Global strategy on human resources for health: workforce 2030, 2016. RCPCH. RCPCH Medical Workforce Census 2013, 2014.
WHO. Treat, Train, Retain.The AIDS and health workforce plan, 2006. Contributors BDH and CMR conceptualised and designed the study, designed the data collection instruments, coordinated and supervised data collection, drafted the initial manuscript and reviewed and revised the manuscript. WN, RA and KDF coordinated data collection, reviewed and revised the manuscript. HPH assisted with design of the data collection instrument including piloting and reviewed and revised the manuscript. WJK advised the international approach, aided with data collection, reviewed and revised the manuscript. All authors approved the final manuscript as submitted and agree to be accountable for all aspects of the work.